Ramen, a bowl of broth containing thin noodles, some vegetables, and usually bits of meat and an egg, is certainly a staple food of Japan. The popularity of this filling and tasty soup has exploded worldwide recently. Trendy ramen shops have been popping up across major US cities. As a result of living in Chicago I’ve tried my fair share of ramen but nothing could prepare me for the sublime ramen that I would scarf down in the Land of the Rising Sun. During my time in the beautiful country I sipped and slurped on three particularly delicious ramen shops in Tokyo and Kyoto. 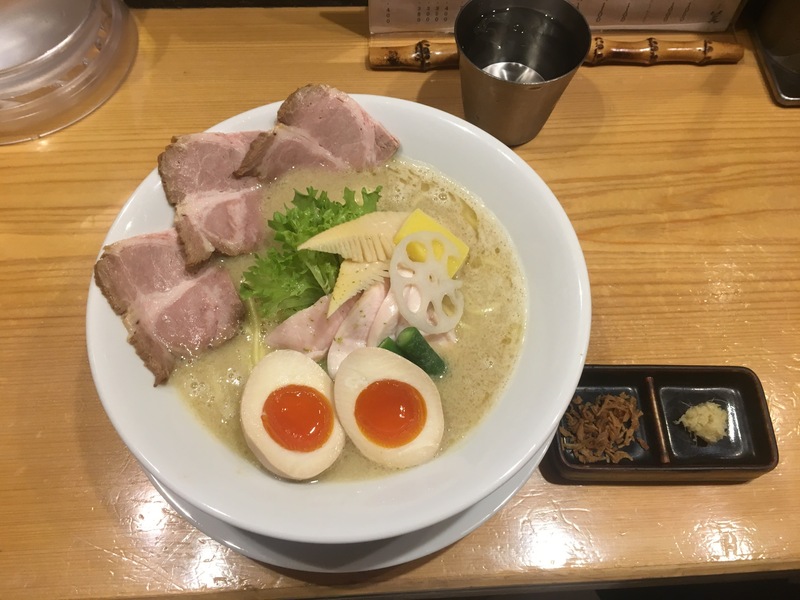 Here are the stories and reviews behind my ramen experiences in Japan. I slurped my way through Japan’s ramen scene with some of my best friends! After a long morning of seeing some breath taking temples, shrines, and the famous bamboo grove in Kyoto, my friends, Alex, Eugene, Jen, Justin, and I were getting pretty cranky and hangry. We needed some food in our bellies ASAP. We settled on a tonkatsu restaurant which offers deep fried pork cutlets among other fried treats. Unfortunately my allergies to seafood and fish forced me to forego the tonkatsu meal because the restaurant fried seafood in the same fryer as the pork and chicken. I was forced to sit and watch my friends feast on delicious fried meats and unlimited miso soup and rice for about an hour. This only made me more hangry and throughout the meal I did some research on the best ramen nearby. I found a tasty ramen shop, Ippudo, that originated in Kyoto, but now has locations in Tokyo and other cities throughout the world such as London and New York. The walk over there after my friends were done with lunch seemed like an eternity but finally I arrived at this tasty ramen shop. Ippudo’s ramen broth is pork based which gives it a nice salty and umami flavor that hits the spot. The service was extremely fast and the environment was fun as I sat at a counter in which I could see the ramen being made. I ordered a special that included a side of pork dumplings. The dumplings were average, not having a ton of flavor to them, but they were nice to have on the side. The ramen was the star of the show with thin noodles, a rich soft boiled egg, slices of pork, thin cut mushrooms, and seaweed in a savory pork broth. The only part of this ramen that was a bit of a let down for me was the broth as there was no spice to it which made it more bland than others I tried in Japan. Nevertheless, it was a delicious ramen as the man sitting next to me can attest. He was slurping his noodles like a ravenous ant eater in a field of ant hills. Boy was he loud but slurping in Japan and other Asian countries is a sign of respect to show to the chef that the dish is good. So if you find yourself eating ramen sometime soon slurp away! The mouth watering Ippudo ramen. I had this delicious and award winning Japanese ramen chain twice and both times it delivered in full force. With locations in several cities such as Kyoto and Tokyo if you visit Japan you are bound to find an Ichiran shop. The first time my friends and I went to Ichiran was after a night of drinking at nearby izakaya bars which are small gastropubs that usually only fit about six to ten customers in. These small bars line streets and alleyways in certain Japanese neighborhoods such as the popular Golden Gai area in Shinjuku, Tokyo. Ichiran is open for 24 hours so we got our ramen fix that night around 2am and it was some stellar drunk food! The exterior of Ichiran in the Shinjuku neighborhood of Tokyo. We started off waiting in line to order food at a vending-style machine where one could lock the type of ramen and add any extra items like egg or extra green onions. I got the ramen with an egg and vinegar sauce. Once seats opened up in the cubicle style seating area we sat down and were handed a card to select the broth spicyness and richness, noodle firmness, amount of garlic, and if we wanted pork slices or not. I took all the recommended selections and added in the pork slices of course. A ramen ordering machine at another ramen shop that is similar to the machine Ichiran has. About 5 minutes later my bowl of ramen was delivered through a small window in my seating area that was connected to the kitchen. I happened to be up out of my seat but arrived to find the ramen with a card that said they would remake the ramen for me if it was too cold. Now that’s customer service! The bowl of ramen was a sight of beauty and smelled wonderful. I cracked my egg on the side, added in the vinegar, and started slurping away! In the kitchen cookin’ ramen at Ichiran. The little stations or “cubicles” for customers to eat their ramen at. I first sampled the broth which had a rich pork flavor with the perfect amount of heat and spice to it from what looked to be red chili pepper flakes. The extra vinegar I added in gave the broth a nice sweet and tangy element to it as well. I then dug in to the rest of the components in the Ichiran ramen. The noodles had the perfect firmness to them and combined well with the flavorful soft boiled egg and tender pork slices. After eating every bite and sipping up all of the broth I felt extremely full but insanely satisfied. We ended our night walking out to the sight of a group of drunk locals pretty much crawling as they tried to walk, as well as one individual who pissed himself right in front of us. The Japanese drink alcohol like its water on weekend nights, and even many times after work with their co-workers and bosses. It was hard not to see locals stumbling around after a night out of drinking in Japan. My ramen at Ichiran served with a soft boiled egg and cup of vinegar. My ramen after adding the vinegar sauce and egg. A thing of beauty! Justin couldn’t get enough of his Ichiran ramen. I’m lucky to have ended up at Ginza Kagari towards the middle of our stay in Tokyo. Being allergic to all fish and seafood I walked as close as I could to the famous Tsukiji Fish Market until I knew I would puff up like a blowfish or Will Smith in the movie Hitch. I then parted ways with my friends to let them get all fishy and such while I wandered the streets of the ritzy Ginza area in Tokyo looking for something tasty that wouldn’t kill me. I first tried out a udon noodle restaurant but after sitting down found out that they put tuna in all of their broths. Just as fast as I sat down I had to get up as locals in the restaurant looked at me like I was a mad man for leaving this well-known udon restaurant. At least they gave me a free bag of noodles on my sad walk out of the restaurant. I then decided I would try another ramen place as most had been ok for my allergies. I looked up reviews and saw that Ginza Kagari had extremely high praise. Upon arriving at Ginza Kagari I saw the line was insane, wrapping from the alley it is located in all the way out to the sidewalk, but had no idea exactly how long it would take. I for once in my life made a decisive decision to stick out the line to get a bowl of this supposedly supreme ramen. I definitely made the right choice! After waiting in line for over an hour while seeing images come in from my friends of all the sushi and fish they were eating I was finally seated in the small ramen shop that only holds 8 people at a time. When walking in I noticed that the restaurant was placed on the Michelin guide so I knew I was in for a special treat. The counter wrapped around the kitchen so that every customer could watch the chefs prepare their ramen, making it a very intimate experience. The chef passed out bibs for all the customers and then began preparing everyone’s orders that we placed outside while in line. The insane line at Ginza Kagari. View of the entrance at Ginza Kagari complete with a sign showing it is on the Michelin guide. The small counter with a great view of the chefs at Ginza Kagari. Got my bib and ready for some ramen. I ordered ramen with a chicken broth, along with chicken and pork slices. As I eagerly awaited my bowl of brothy goodness I watched the master chefs cooking my ramen, noticing the ease at which they moved through the kitchen and the attention to detail they had when placing the ingredients into the bowl. They had definitely been doing this for a number of years. Finally, I was served my ramen which also included a soft boiled egg, green onion, and greens. The smell instantly made my mouth water and I immediately dug in trying the broth first which was by far the richest and creamiest ramen broth I had in my stay in Japan. There wasn’t much spice to the broth but the rich and creamy chicken flavor in the broth made it so that wasn’t an issue. The ingredients in the ramen were also all top quality and the soft boiled egg in the dish was the best egg I’ve ever had. It was cooked perfectly and the center yolk was bursting with flavor that accompanied the broth, chicken, and pork extremely well. One more shot of this beautifully plated and delectable ramen at Ginza Kagari. As I got up to leave after paying my bill I walked out thinking in my head that it was without a doubt the best ramen I’ve ever had. About a week later there is still no doubt that Ginza Kagari has the best ramen I have ever had and fully earns the praise it has recieved from reviewers. If you are in Tokyo then brave the line for this amazing Michelin Guide recommended ramen spot. You wont regret it!